And you walk to the center stage with your ghungur tightly attached to your ankles, chiming with every step you take and the first drop of sweat trickles down your face. You look beautiful and presentable with the layers of makeup. You take your opening position and try to find some familiar pairs of eyes. But everything in front of you is dark and you are oblivious to the audience and their reaction. You feel so light that you might just float away like a leaf but then you are weighed down by so much jewelry and costume. A yellow spot light falls on you like the ones in interrogation rooms and artificial smoke is let out. But the music finally reaches your ears and you feel tranquil again. You are a performer, an artist, a dancer and you are divine. Why do people still dance classical, ever wondered that? What's so fascinating about it, that even after the excruciating amount of effort and practice and pain, performers say that it's totally worth it? We talked to some brilliant dancers to find out about the magic behind classical dancing. Their answers will take your breath away. So many learn dancing as an exercise, a kind of fulfillment of their parent's dreams, just another extracurricular activity, or simply as entertainment. But isn't there more to dancing? Young aspiring classical and contemporary dancer/choreographer, Amit Chowdhury, agrees. To him, dancing is oxygen – meaning, there is no way he can live without it. On stage doing solos, he feels like he is his own competitor, always striving to do better than himself. He says, competitors and criticisms are important tools for dancing. He talks about expressing oneself to the fullest through dancing with pure satisfaction. Though being a male dancer, and having to perform with twice as much mental strength than females in our community, he is proud to shout out loud that he is a dancer by profession. That there's more to such artists than what the general masses think of them. Highly established classical dancer from West Bengal, Rajdeep Banerjee, says, without hesitation, that classical dance is divinity and life. When asked what a person can get out of dancing he said, “We dance for ourselves and our souls. By dancing, we express and understand ourselves. It gives a positive aura around us. So we should dance, to entertain ourselves and our minds.” On stage, he goes into a trance of spirituality. The stage isn't just a stage. It is a platform via which we can connect to God. And the way to connect is by practice – Shadhana. The music should be heard and taken into the soul, from the soul we feel it properly and concentrate. “We dancers take the audience from their ordinary daily life of everyday things to a whole new world,” says Rajdeep. In our conservative community, how would we bring about the popularity of dancing, when people think that it is not religious for girls to dance and when male dancers are looked down upon, as if they aren't like other men? In Amit's opinion, dancing is actually a sacred action and the kind of reality shows being produced in our country in the name of 'dancing' is totally wrong. When dancing is even capable of changing someone's life completely, why should it be misjudged that way? 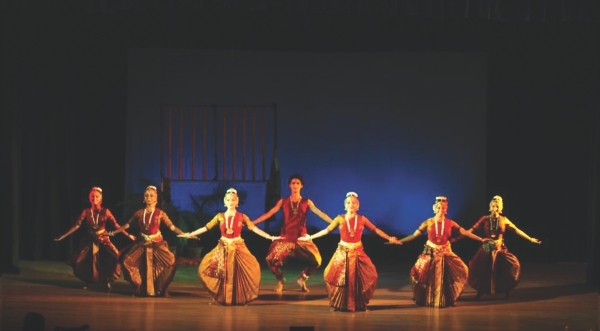 Rajdeep believes that dancers themselves play a great role in being thought of in such a way. Is dance only an entertainment and dancers only entertainers? The entertainment factor cannot be discounted, but in reality, what it really is, is a form of education. If dancers think of themselves just as entertainers, people will eventually take them for granted and the underlying philosophy behind their lifestyle will inevitably carry less weight in society. But if it can be understood that dancing is another medium of education. That the rhythmic movement of the bodies is just another way of teaching us about life's many virtues and pitfalls, then we'd really be making some progress. About male dancers, he thinks that they struggle more than females as they have to fight against their community, their friends and family and the rigid conceptions of society. On top of that, they have to become economically established. They indeed travel a great way for their passion.